It is with deep sorrow that the Loma Linda University School of Public Health informs you of the passing of Dr. Samuel Soret, PhD, a beloved colleague, professor and friend. He passed away from a heart attack while on a trip to Spain on Tuesday, August 23, 2016. Dr. Soret faithfully served the School of Public Health for 21 years, most recently as Associate Dean for Research and Executive Director of the Center for Community Resilience. The funeral services for Dr. Sam Soret will be on Friday, August 26, at 1 p.m. in his home town of Calahorra, Spain at the local Seventh-day Adventist Church. The president of the Adventist Union will officiate at the services. Dr. Joan Sabate is in Spain, and plans to attend and participate, representing all of us as friends and as SPH. The burial will be in Spain. 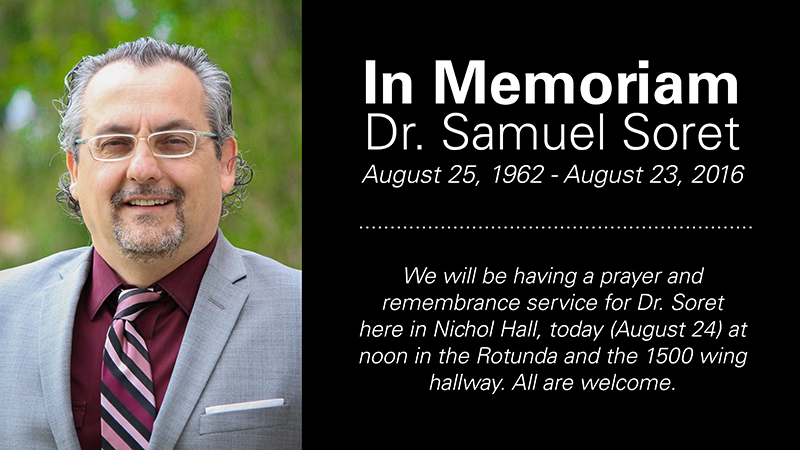 We will be having a prayer and remembrance service for Sam here in Nichol Hall, today (August 24) at noon. We have moved it to the NH Rotunda, and the NH 1500 wing hallway. All are welcome. We have grief support counselors and pastoral staff in NH 1710 (the conference room in the Administrative wing). They are here to serve us in this time of grief and mourning for our friend, mentor, and colleague. Each of us grieves not only for the passing of a tremendous individual but also for the loss his family suffers. Thank you for your prayers. Sam treated people with dignity and respect. It was always pleasant to talk with him. Last conversation I had with him was not to long ago when he asked me to make a presentation for the faculty on Obesity Research as part of working with the School of Medicine. As lately I focused my research in Diabetes in the Hispanic population, I suggested that instead I discuss this topic. Sam in turn suggested I will discuss the diabetes research in the next meeting. As always he answered in a polite and gracious manner. He truly followed the saying "People will forget what you do and what you say, they will never forget how you make them feel". Sam will be greatly missed. for this sensible loss on this earth. in his office I certainly hope to see him again. May we all share this hope in Him. I still can't believe the news of the death of Dr. Sam Soret. He made a big difference in our community for his enthusiasm for research in public health, collegiality and service to the students. His spontaneous sense of humor and friendly smile will be missed. I offer my deepest condolence and prayer to family members on my behalf and of the Loma Linda Center For Health Disparities and Molecular Medicine community. My deepest condolences to the SPH and to Dr Soret's family. I remember when he joined the School and was pleased to see him grow in many ways. He made significant contributions to the School over the years and he will be greatly missed. Sam was truly a bright spot in the environment of our university. He was positive, forward looking, committed to service and the advancement of public health in the most positive ways. He was one of the few people that I could talk to about all encompassing ideas and after talking, or more likely listening, he would always help me to take them to even a new level upward. I was always inspired after talking with him. He was also a man of faith. We could talk about the spiritual dimension of our work without missing a beat. He was always looking for where God was leading. I really don't know why God allowed Sam to pass away. I have had a serious discussion with God about this today. I know that it was not God's intention that he die (that must be blamed on another) but on the other hand He has promised to make all things work together for good to those who love God and are called according to His purposes. If that is true then God has a plan to see that all Sam's good work will come together in ways that will honor and glorify God and enable God to be seen as the one who loves us and who desires the most abundant life for all of us. I will find peace and hope in that promise. But for right now there is a big hole where Sam used to be! I personally will miss him so very much. I also know that we will miss him terribly at the school and the university. He loved us and we loved him. It will hurt to think of him being gone but I will not forget all the inspiration and leadership he provided as well as the laughter and excitement. I promise to press onward on the projects he encouraged and started in my little corner of this world doing my part to carry God's work forward. Thank you, Father, for the privilege of living and working with one of your most precious children, Sam. He made a difference in my life, my work, and definitely this world. And you have promised that I will see him again, possibly very soon! I can't wait! Sam was a humble and helpful man. I'm proud to have known him. May his family have comfort in the promises of our Lord that He "will come again"
May the Lord comfort your aching hearts during this difficult time. I always appreciated the joy I saw in Sam as he created and processed new ideas. He was truly collaborative and open to working with others to make good things happen. I am hoping that this coming Healthy People conference, for which he was heading up the planning, will be all he wanted it to be. In the short amount of time that I was privileged enough to work with Dr. Soret, I was able to learn so much and feel so blessed to have been able to do so. He was such a light to this world - always so vibrant and full of life. The world has lost an extraordinary man. But I take comfort that he has returned home with our God, where he finds peace and rest. My deepest and sincerest condolences to all of his family and friends. Dr. Soret's legacy of inspiration and adoration will truly live on in our hearts. I am so sorry to hear of Sam's passing. I knew him and his whole family in Spain when he was just a very young boy. I send condolences to Monste, his sister and my friend. We will see him soon Monste, in a better land! Dr. Samuel Soret served as a father at home, a church member, a professor in ministry and most of all a friend! I dedicate this poem in his memory. ¡Oramos a Dios por tu familia! I have not know Dr. Soret for long as I am relatively new to the Loma Linda family. I will say that the encounters that I had made a lasting impression as he had the gift of making you feel like the most important person in his world at that moment. We had a meeting at San Manuel Gateway College where he was touring the Mexican Consul for San Bernardino and making connections between the Hispanic community and Loma Linda. He was always looking for ways to reach out and meet the needs of those in need and to not only help them with their immediate needs but to teach them to live a healthier life. The other instant connection that I had with Sam was learning that he had know my grandfather, Werner Wild. After retiring from the ministry, my grandfather committed to help start the seminary in Valencia Spain later to be moved to Sagunto. Having connections in the great Adventist family is a privilege and honor as we have the common goal of serving our Lord where ever we are. Sam served with that enthusiasm and passion to share the love of Christ with everyone he came into contact with. Until we are reunited may we honor Sam by doing the same. It was a pleasure to get to know Dr. Soret but I am really sorry about the loss. Sam has truly been a blessing to my family for all these years. Our deepest sympathies go to everyone who is mourning with us and particularly to his immediate family. It is my prayer that God gives us the comfort and peace that we seek at this difficult moment as we mourn this loss. Dr. Sam was a warm and kind soul. I remember his laughter resonating in Nichol Hall, when I was a public health student. Though I didn't have any classes by him, I remember many classmates speaking about his great enthusiasm. His love for teaching was clearly evident; shaping minds with the Master's touch. Prayers to his beloved family. Dr. Soret taught me classes during my tenure as a graduate student at LLUSPH as well as being in charge of the Environmental Health department while I worked in the GIS lab. I am completely shocked that he has passed. I learned considerably about GIS and public health from Dr. Soret and my prayers will be with his friends and family. The faculty, students, and LLU community will be beggared by his loss. What a joy it was to know Sam and to work with him! He often invited me to discuss the work I have been privileged to do in my home country of Malawi and how we could expand it to include other faculty members. The conversation would often divert to analyzing the Spanish and English Premier Soccer League matches; some of which we watched together at my home or his. I will miss his sharp intellect and gentle spirit. I thank God for Sam's dedicated service to our School. May God's love and grace be with his family. Of a master who left too early. Of just thinking how much more we could have accomplished together.